The Supreme Court showed the world today that there is nothing supreme or noble about it and that it is as corrupt and cruel as most other governmental institutions. In a 6-3 vote, the high court ruled for Wyeth, saying they could not be sued for vaccine damages. Wyeth is now owned by Pfizer Inc. 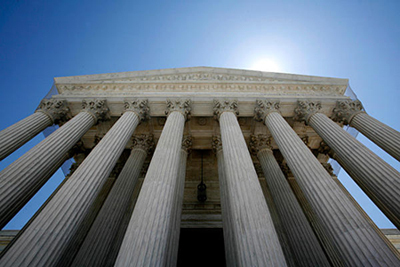 The U.S. Supreme Court ruled that federal law shields vaccine makers from product-liability lawsuits in state courts seeking damages for a child’s injuries or death from a vaccine’s side effects. The trial case was a lawsuit by the parents of Hannah Bruesewitz, who suffered seizures as an infant after her third dose of a diphtheria-tetanus-pertussis (DTP) vaccine in 1992. The U.S. Supreme Court ruled on Tuesday the 22nd of February 2011 sustaining the federal law that shielded vaccine manufacturers from desperate parents who seek damages for serious health problems suffered by their children. Today’s children are hit with more shots in a day than most of us were hit with in our entire childhood. No doubt certain pharmaceutical madmen fantasize having a permanent tubular hookup with every child receiving constant (24/7) chemical injection and the Supreme Court would obviously go along with that. Pharmaceutical terrorism and medical madness is alive and well in this world of ours and is part of the backbone of our modern civilization and the legal system has totally bought into it even though they understand nothing about medicine and the consequence of supporting the madness of pharmaceutical companies. The National Childhood Vaccine Injury Act of 1986 is a law that was adopted by Congress that created a special program to handle disputes in an effort to ensure a stable vaccine supply - by shielding companies from most lawsuits. The federal program, involving what is known as the vaccine court, has awarded more than $1.8 billion for vaccine injury claims in nearly 2,500 cases since 1989. It is funded by a tax on vaccines. The 1.8 billion dollars awarded is proof positive that vaccines are not safe. And everyone knows that the government employs an army of lawyers to make it as difficult as possible for parents and their lawyers to win their cases. A careful study of pharmaceutical terrorism entails taking a trip into the darkest places that exist in humanity and it is no accident that when we make the journey we find ourselves in places where doctors and scientists work together as they did in Nazi Germany. This subject takes us to the bottom cellars of hell, into the deepest and darkest dungeon, into a place and into a type of person that defiles the very nature of beauty and love, a place where all human heart is lost. The Nazi doctors offer us a view of monsters that have remained invisible, dressed as they are eternally in three-piece suits or white lab coats. And now we have the Supreme Court of the United States in on the terror supporting laws that support and protect vaccine companies. Let’s face it, our children’s lives have been ruined. with thimerosal-induced autism? It’s not pretty. live in a daily hell that many cannot even begin to imagine. They can’t sleep. They can’t communicate. They bang their heads and roll up in pain. Many have eating disorders or cannot tolerate most foods. And many are easy targets of sexual predators. There is a direct line of continuity that can be traced between a group of men and companies that arose to the heights of industrial power years before Hitler, men and companies who existed and supported the rise of Nazi Germany and who continued on to the present day in comfortable corporate luxury and power. Bayer experimental drugs were tested on Auschwitz prisoners. Bayer experimental vaccines and medicines on inmates. Not only has that cartel survived through the years, it has grown and prospered. Eustace Mullins described very well the roots of this nightmare and how John D. Rockefeller, with the help of the American Medical Association and government officials, gained control of America’s “health” care industry in the early part of this century. “Educating” medical students was instrumental in their plan. On the day of our birth doctors and nurses, with the willing acceptance and surrender of our parents, plunge cold steel into our flesh and inject a foreign fluid laced with poison and other modified genetic materials that assaults our immune and other critical systems of our bodies. Babies cry when their basic needs are frustrated, they cry when they are in need and when they are attacked and hurt. before the implementation of mass vaccine programs. The Nuremberg War Criminal Tribunal convicted 24 I.G. Farben board members and executives on the basis of mass murder, slavery and other crimes against humanity. Amazingly however, by 1951 all of them had already been released, continuing to consult with German corporations. Today each of the three daughters of the I.G. Farben is 20 times as big as the I.G. Farben mother was at its height in 1944, the last year of the Second World War. In 1998, the pharmaceutical giant, Bayer, conducted pesticide experiments on humans in what was called the Inveresk trials. Three years later the company behind the tests stands accused of breaking the Nuremberg Code. The Sunday Herald in England reported that subjects were given a single dose of a substance called azinphos-methyl (AM) and then observed for seven days.